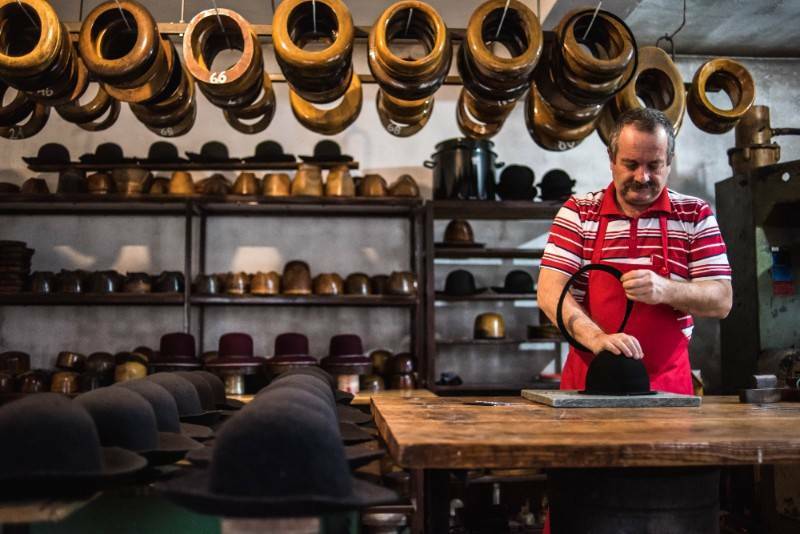 At a time when almost all the old hat factories and shops in the country have been closed for a long time, and the hat making and millinery crafts are still rarely encountered, I am proud to know, and be able to call them my collaborators, the ones that have been beautifully covering the heads of Romanians for more than 120 years. In order to bring to life the very first collection of NITA SAO hats available in a limited series, I certainly needed a reliable help. And what better one than the first and last factory of felt hats in Romania - Dădârlat. 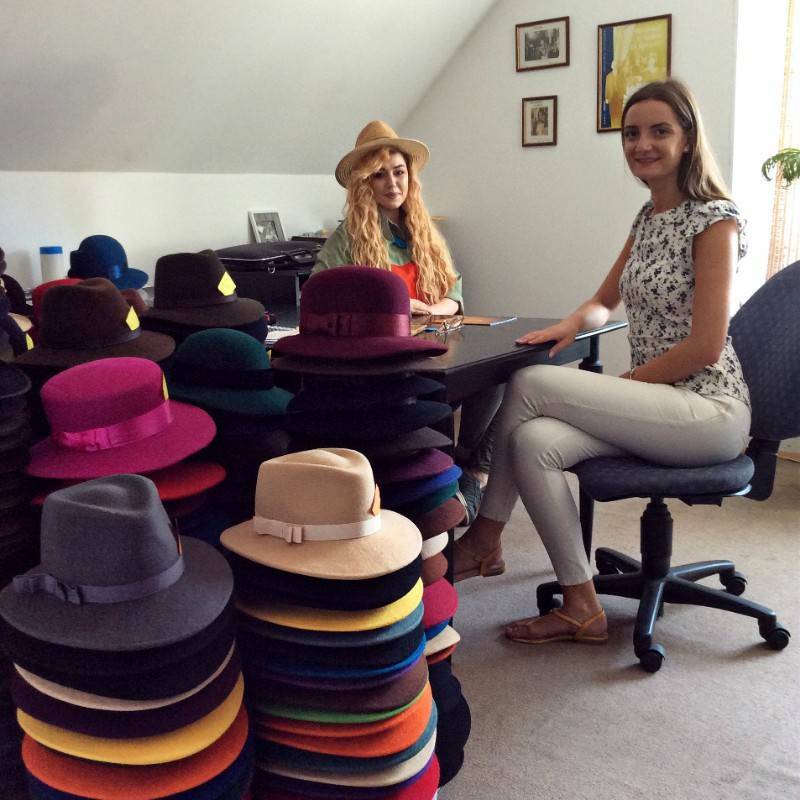 During one of my visits to Sebeş, I had a cup of tea with beautiful stories on the side with Mădălina Dădârlat, the representative of the fourth generation of hat makers. 1. Mădălina, you have three models to follow, which, as you have admitted, put pressure on you by what they have achieved. Tell us their story! Yes, that’s right! And to use a word play, they put pressure through passion, because every single generation contributed in the first place with a lot of passion! My grand-grandfather, whom is the "story" in itself. The man who started everything more than 120 years ago, a person close to a myth, whom I know from photographs and stories, the inspiration to everything we do today. The second model is my grandfather, with whom I spent my childhood, a very stylish man, a perfectionist, extremely correct and with a great attention to what quality means. That is why I decided to take over this business. And of course, my father is the third model, the businessman with a pragmatic mindset, oriented towards a continuous development, the man who always manages to do lots out of little, the "pillar" of the present business. 2. You certainly have the passion for hats in your blood. But it is a difficult job, whether you work in the workshop or in the office. I would like for you to tell me, from a young woman in the industry to another, which is the most pressing aspect of this job. How about the most gratifying one? As you well know, it's a somewhat forgotten trade, at least in our country. It's a job that requires first and foremost skill, attention to details and patience. It worries me that the new generations no longer emphasize the qualities listed above. In return, I am very happy when I travel anywhere in the country and see people wearing our hats on the street! I recognize them from thousands and yes, that puts a smile on my face every time it happens! 3. I noticed that when a person from outside the industry thinks of a workshop or a hat factory, he/she imagines a real army at work. Both on the manufacturing and the administrative side. Not a total of people whom you can count on the fingers of one or two hands, as it is in both of our cases. How does one of your days, certainly very hectic, at the factory looks like? As you also know from experience, when you are emotionally involved in what you are doing, there is no such thing as an 8 hours schedule. Purchases, deliveries, production, accounting, promotion, availability in front of the client, creation and yes, the need for recreation, that’s how I would briefly describe a day at the workshop! My work does not end when I leave the workshop, I am permanently connected with the customers. In the future, I think it would be good to separate my personal like from the professional one, but for now the enthusiasm and the business ideas do not let me do that. 4. We are living the centenary year. 100years ago your great-grandfather was in the workshop, preparing for the celebration. I know you asked your parents how they think that day looked like in Salişte. Share their beautiful answer with us. Many stories remained untold but I try as much as possible to find out everything that helps me get back to the roots. Their answer to the question you mentioned came very promptly: “In the times when things were fixed, not replaced, the queue was as long as the street at the workshop. There was a big celebration coming and the hat was supposed to be cleaned by the book! It was a cult to have a hat, there was no man or woman without one! " 5. As we both noticed, hats begin to recover the ground lost in the last decade. Hopefully, we will soon again have those queues in front of the workshops. Whom are the most loyal customers of Dadarlat hats today? Ladies or gentlemen? And which is their favorite hat type? Until I came to my company, my parents’ main target was people age 40 and older. Those elegant gentlemen and bohemians ladies whom know what quality means. Currently, I have diversified the range and I have also targeted the youth. We sell very well to both ladies and gentlemen and I am pleasantly surprised that we have a very high demand from the youth as well! 6. I congratulate you again for the new look of the factory and the brand. It further emphasizes the traditional values ​​but also makes an extra step towards the modern. What are some of the plans for the future? Thank you for your appreciation, I try to put a lot of emphasis on the story behind the product! I like to consider myself a dreamer and it is said that if you advance with confidence in the direction of your dreams, you will experience unusual success in ordinary times! I'm thinking of a reorganization of sales, possible by creating new models! As I said above, I'm looking for other target groups too! I go with the flow, I dream with my eyes open, I put on paper any idea I have and things have already begun to take shape! I want to make a contribution at least as great as my three models had, and I am sincerely doing it, being my soul story! Chapeau and best regards, Mădălina!